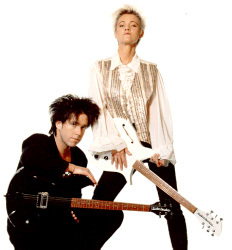 It's Roxette, and they have "the look" that stands for talent and success. In January of 1989 they were named best Swedish group of the year ... not really surprising for a pair that have had their songs consistently rise to the top of the charts around the world. Two singles from their album "Look Sharp", "Dressed for Success" and "Listen to your Heart" have gone gold. Their song "The Look' moved to number one in Sweden in just two weeks as well as zipping up the charts and receiving blockbuster video play in the U.S. Per Gessle and Marie Fredriksson seem to take their popularity in stride. One would suppose that part of their success is due to their great working relationship and long standing friendship, attributes that give rise to their own kind of harmony. As a matter of fact, not only does their unique sound stand high above most of the musical herd, so does their judgment in their choice of guitars. Rickenbacker specially designed and color coded both of their guitars especially for their dynamic stage performances. Per has a Rickenbacker based on a model 330 done in Jet black, while Marie's Rickenbacker, based upon a model 325, is as white as a Scandinavian winter. They believe they are at their strongest as a band when they perform live. We believe a Rickenbacker is at its best in the hands of any band as brilliant and talented as Roxette.